Although not as great as the two previous years, 2003 Bowman Chrome Baseball still has a handful of notable autographed rookie cards that keep it desirable. The big ones are Hanley Ramirez and fan favorites Brian McCann and Kevin Youkilis. 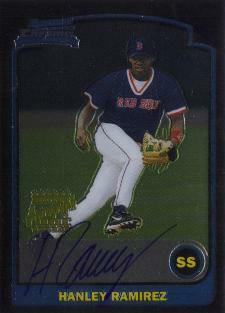 The base set consists of 351 cards including 20 autographs, which bookend the checklist. Short prints were abandoned outside of the signed cards, which is great for set collectors. 2003 Bowman Chrome Baseball also has a hint of vintage with Willie Mays occupying the last spot on the checklist. The card design has a familiar feel with the traditional black borders. Veterans have a red frame, while rookies and prospects have a blue frame. 2003 Bowman Chrome Baseball has a ton of rookie cards, however they're hit and miss. Outside of the key players, there aren't many second-tier rookies like other Bowman Chrome sets. Multiple levels of parallels are the main insert draw. All base cards have Refractor and X-Fractor versions. 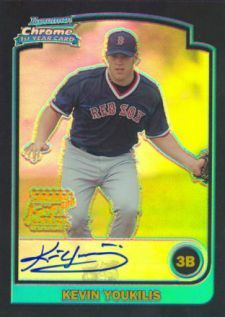 Unlike most years where Gold Refractors are limited to 50 copies, in 2003 they were inserted as uncirculated box toppers and numbered to 170, making them much more common and much less desirable. 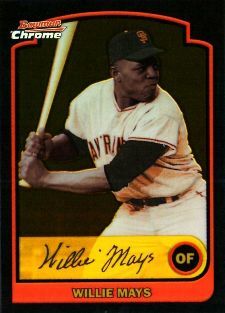 The only other insert in 2003 Bowman Chrome Baseball is a Willie Mays Autograph, which is limited to 150 copies. Hobby boxes have 18 packs of four cards. Sealed boxes should have one autograph card. 2003 Bowman Chrome Factory Sealed Baseball Hobby Box Brian McCann AUTO RC ?